Jakarta Governor, Anies Baswedan wants synergy between three pillars of TNI, Police, and Jakarta Government for Asian Games XVIII succession.
" In this morning assembly, I want people to know that Jakarta security elements are solid"
Not only leaders coordination, but Anies also assessed personnel on the field have an important role to succeed the biggest sport event in Asia. 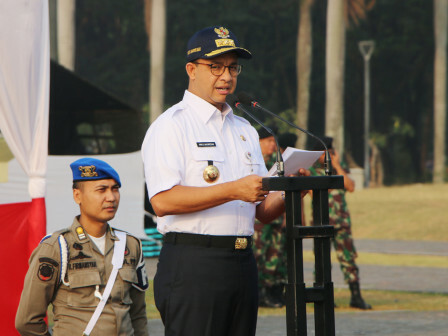 "In this morning assembly, I want people to know that Jakarta security elements are solid," he expressed while leading assembly which is attended by 1,600 personnel from three pillars at Silang Monas, Gambir, Central Jakarta, Wednesday (7/25). He affirmed, Asian Games guests' security and comfort are important to be concerned. It needs solid collaboration between three pillars to prevent miscommunication. "We need to maintain conduciveness, security, and orderliness for Asian Games succession," he added. In this mo rning assembly, security simulation and fire simulation are also done to train those personnel.